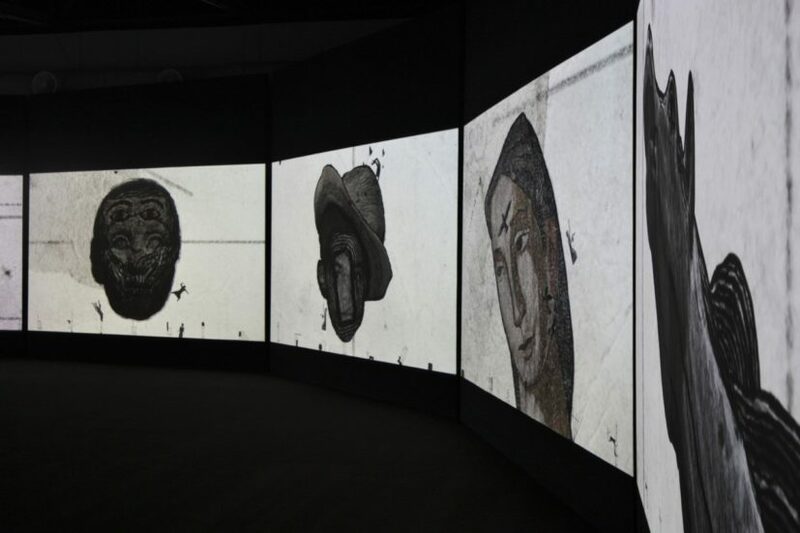 Sadik Kwaish Alfraji Once Upon A Time: Hadiqat Al Umma (2017), 9-channel HD video with sound 8’10” duration, installation view at Maraya Art Centre, work commissioned by Barjeel Foundation and supported by Ayyam Gallery. 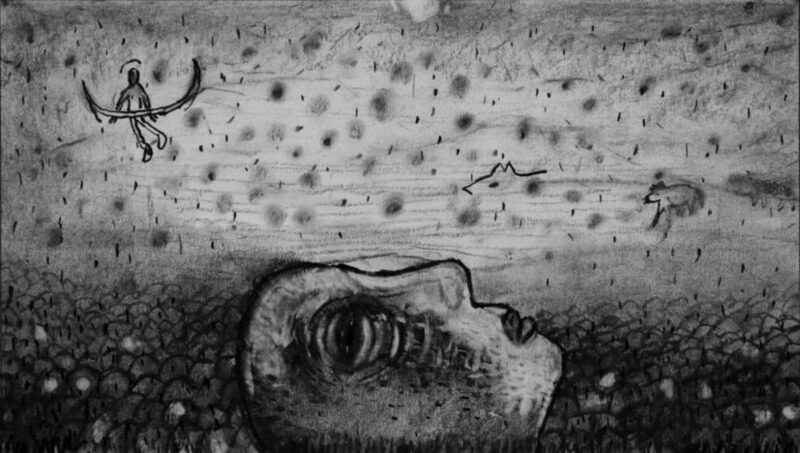 : Sadik Kwaish Alfraji Ali’s Boat (2015) animation frame drawing, charcoal on paper, C. Sadik Kwaish Alfaji. Reproduced by permission of the artist. 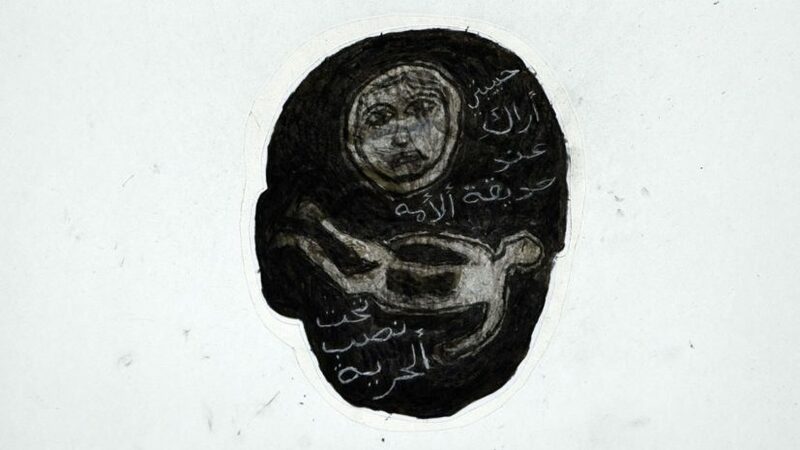 Mostly working in sombre black and white and with personal source material, Sadik Kwaish Alfraji probes and elucidates the anxiety, loss, fragmentation and lapses in time that underline exile. 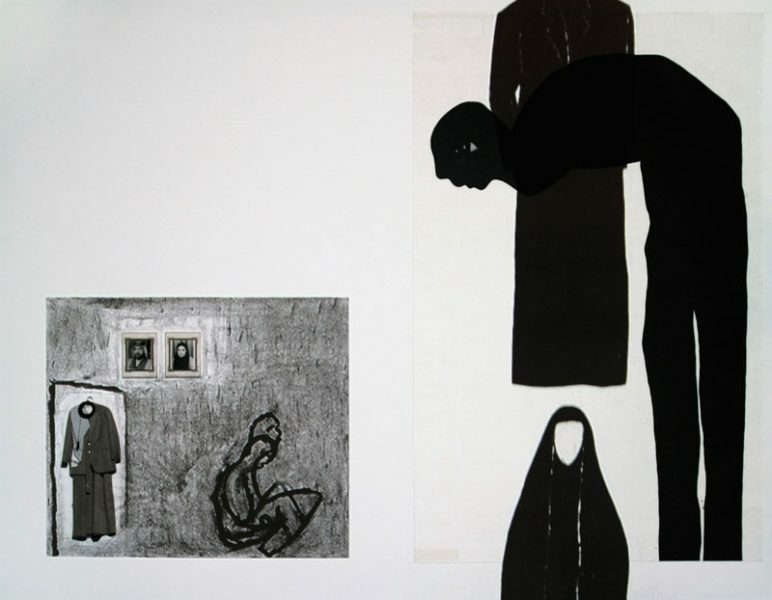 One of the most important Iraqi artists of his generation, who will be representing his country at Venice this year, he explores what he describes as ‘the problem of existence’ through a range of media, including drawings, paintings, video animations and installations. His distinctive style is influenced by childhood memories of Ashura – the dramatic public ritual mourning of the death of Imam Hussein at the Battle of Karbala – Ancient Assyrian reliefs, and the work of the German Expressionists. 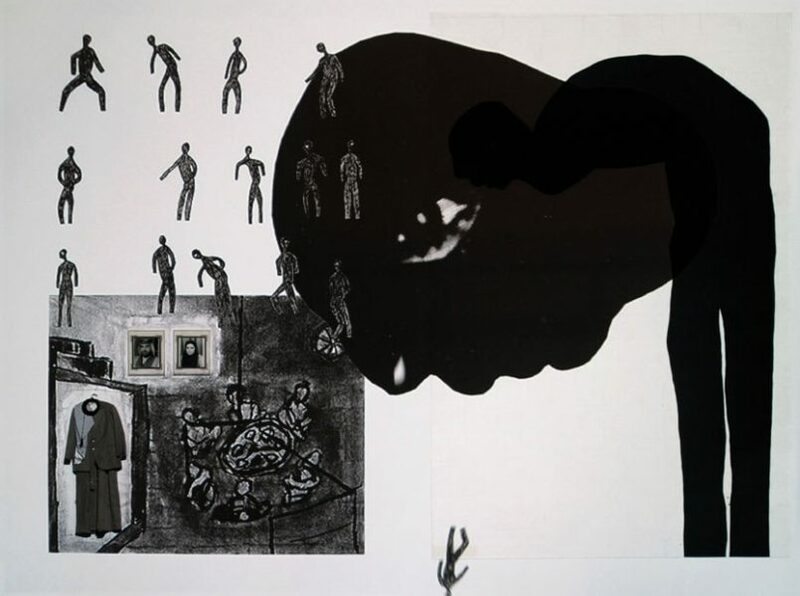 His work is rooted in his experience as a young man of witnessing the horrors of the Iran-Iraq war (1980-1988) and its aftermath, and later as a political refugee living in exile in the Netherlands. His work is deeply moving and although frequently melancholic, reflecting on experiences of pain and sorrow, its heartfelt humanity and compassion also offers us hope. One of his seminal video works The House My Father Built (2010) in the Barjeel Foundation Collection was shown in the Whitechapel’s Imperfect Chronology: Mapping the Contemporary II last year. 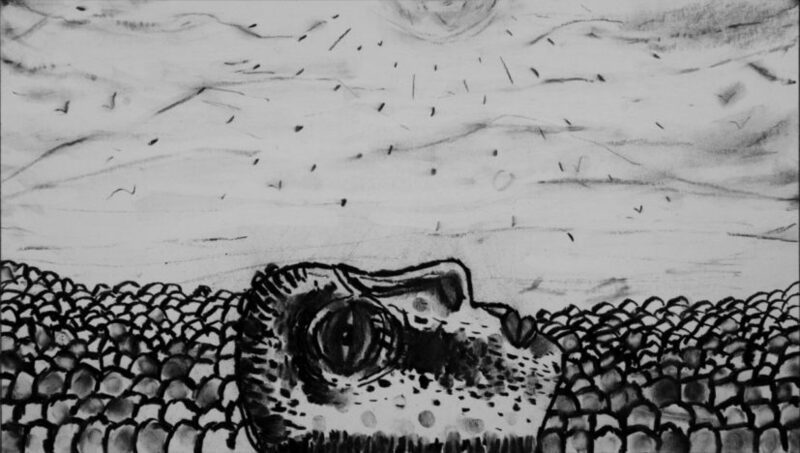 It narrates the artist’s first return visit to Iraq in twenty years, following the death of his father. Scenes of the family house are watched by a looming black figure, bent over, frozen in pain; an alter ego for the artist. You can catch his work on view at the British Museum until the 30 April in the display Moving Stories: Three Journeys, were Alfraji’s book and drawings Ali’s Boat, acquired by the museum in 2015. 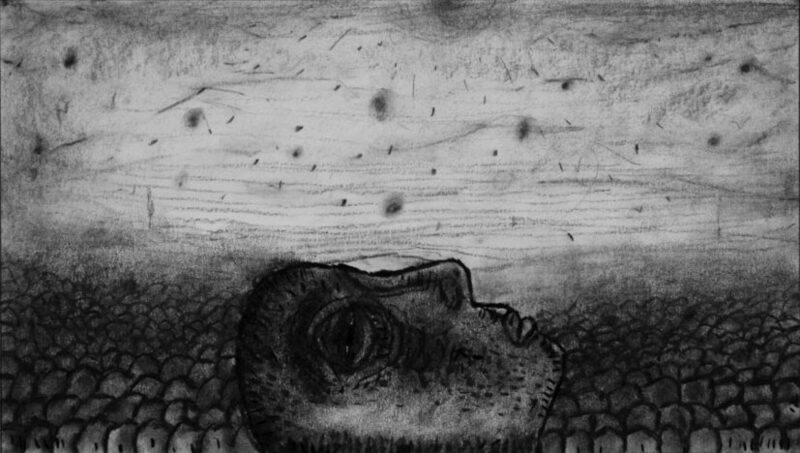 It was inspired by the artist’s encounter with his 11-year old nephew, Ali, on a visit to Baghdad. Ali gave his uncle a drawing of a boat with the words ‘I wish this boat takes me to you’. 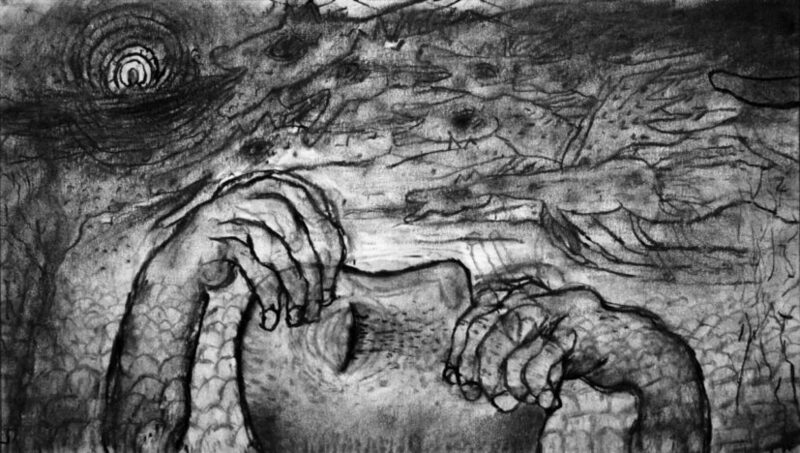 Alfraji’s book warns of the difficulty in the journey of escape his nephew dreams of, a mirror image of his own exile’s impossible desire to return. Entering a new world can be filled with dangers and disappointments, like a game of snakes and ladders, a visual trope woven through this work. This display addressing the very pertinent subject of migration, allows Alfraji’s work, that is much admired internationally, to be better known in the UK. Alfraji is currently showing Once Upon A Time: Hadiqat Al Umma (2017) at Maraya Art Centre in Sharjah. This elegiac, nine-channel video installation is inspired by his childhood memories of the Hadiqat Al Umma park in Baghdad, in the 70s, a golden age of peace in Iraq. Scenes from his childhood and teenage years merge with images of three iconic modernist works of art in the park and a photograph of the artist aged about 8 in a cowboy hat, taken by a street photographer. The title of the work suggests that a story will be told. In fact, there is not one single narrative but flashes of stories, a series of visions from the park. These fragments of lives, seen and imagined, float in front of us like apparitions, reconstructed from the artist’s emotional and visual recollections. 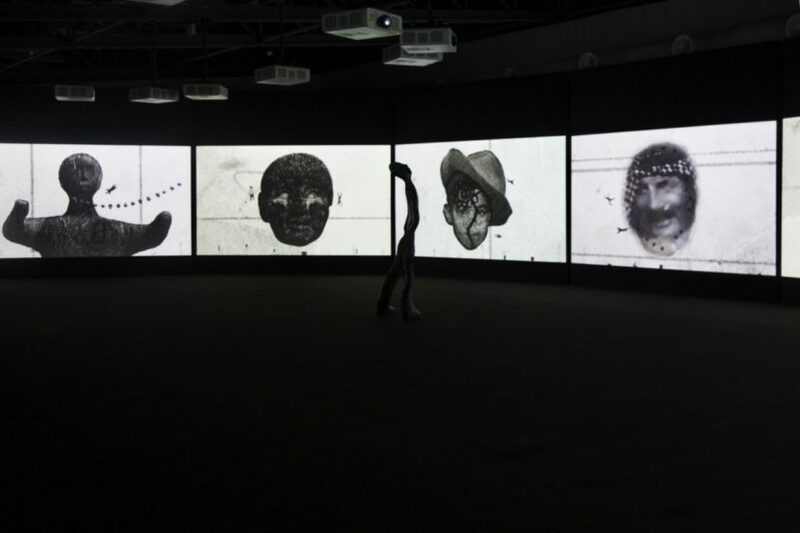 Alfraji’s charcoal drawings become mesmerising video animations that together create a panoramic installation. A sculpture of a black figure stands in the space, representing the artist at a later point in time looking back, a silent double for the viewer. At Art Dubai in March, Alfraji presented Seasons of Lost Baghdad (2017) a continuation of his exploration of how memory and exile shape consciousness. Composed of 209 etchings it, this aerial map of Baghdad filled the outline of a figure in flight, an abstracted self-portrait of the artist. 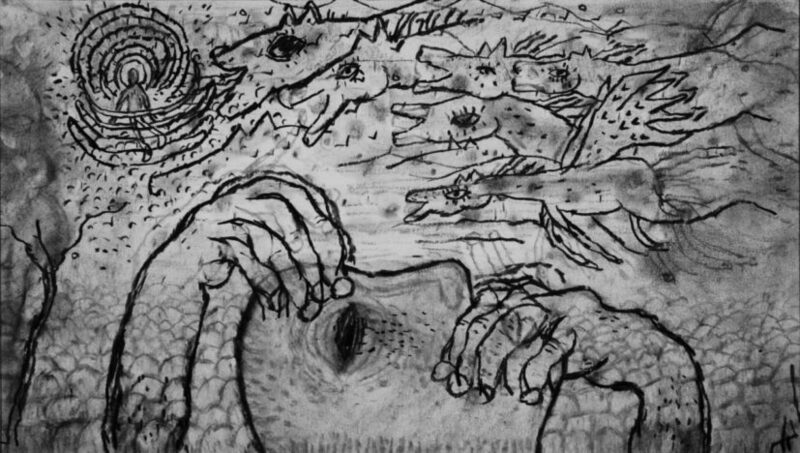 Be sure to see Alfraji’s newly commissioned work exploring the timeless theme of hunter and prey in the Iraqi Pavilion at the Venice Biennale opening this month. This is the third edition to be organised by the Ruya Foundation, whose mission is to promote culture in Iraq. The exhibition is entitled Archaic, referring to a dual understanding of the landscape of Iraq, where ‘archaic’ can simultaneously describe an ancient cultural and geographical heritage and a fragile contemporary political entity. Alfraji is one of eight modern and contemporary Iraqi artists exhibiting in dialogue with 40 artefacts drawn from the Iraq Museum spanning six millennia, from the Neolithic Age to the Neo-Babylonian Period. 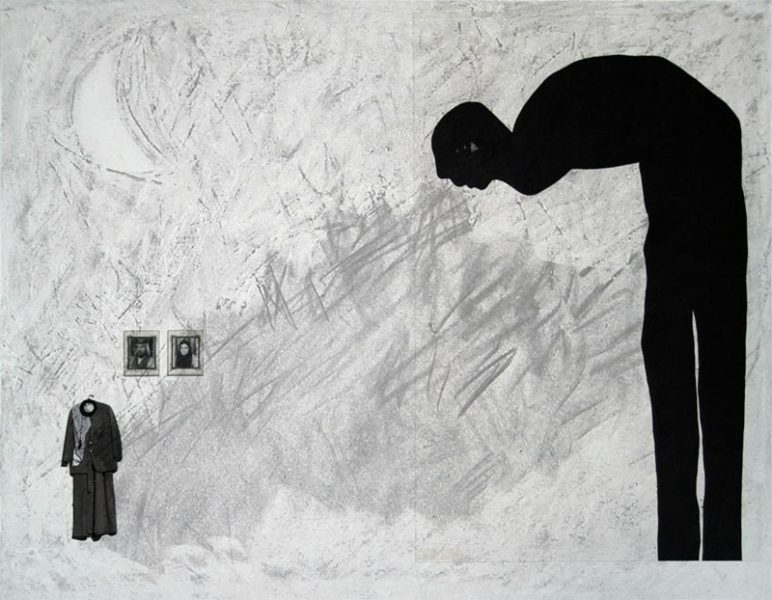 Born in Baghdad, Iraq in 1960, Sadik Kwaish Alfraji lives and works in Amersfoort, Netherlands. He is represented by Ayyam Gallery, Beirut and Dubai. He received a Bachelor of Fine Art in Painting and Plastic Art from the Academy of Fine Arts, Baghdad in 1987 and a High Diploma in Graphic Design from CHK Constantijn Huygens, Netherlands in 2000. The artist’s solo shows include Maraya Art Centre (2017); Red Star Line Museum, Belgium (2016); Galerie Tanit, Munich (2016); Ayyam Gallery Beirut (2015); Ayyam Gallery Al Quoz, Dubai (2015); Beirut Exhibition Center (2014); Ayyam Gallery London (2015, 2013); Ayyam Gallery DIFC, Dubai (2011); Stads Gallery, Amersfoort, Netherlands (2010); Station Museum, Houston (2008); Stedelijk Museum, Den Bosch (2007).